Sigrid Blomberg was a significant sculptor, best known for her sacred art. Sigrid Blomberg grew up on her father’s farm in Skärshult, Småland along with five siblings. She was the daughter of Charlotte Lundqvist and the property owner Alfred Blomberg. Sigrid Blomberg spent her school years at the Nisbeth girls’ school in Kalmar. She began making woodcarvings at an early age. 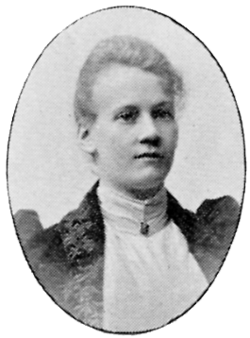 In the autumn of 1888 Sigrid Blomberg enrolled at the technical school for female apprentices in Stockholm in order to become a carpenter. Initially she had no intention of becoming an artist, but one day she tested a material that was new to her, namely clay, and began to see new creative possibilities. At the age of 26 she enrolled at Konstakademien (the Royal Swedish Academy of Fine Arts), which she attended from 1889 to 1898. She participated in Axel Tallberg’s first etching course from 1895 to 1896. During this lengthy period in academia, she also spent several years studying in Germany. Sigrid Blomberg received her first artistic distinction, the Academy’s Hertigliga medal, in 1894 for her sculpture Ormtjuserskan, which was bought for Västerås castle. In 1896 she was awarded the Ribbing stipend “for diligence”. She later also received subsidies from the Academy’s special maintenance fund. During her last year at the Academy Sigrid Blomberg became the fourth female sculptor to be awarded the royal medal. She received it for the two figurines Kristus and Maria which were shown at the annual Academy student exhibition. They formed part of a sculpture group, which Sigrid Blomberg was working on for Oskarshamn church. The Academy provided her with her own studio, where she completed the group, which comprised five figures. It was installed in the church by the end of the year. Commissions and distinctions enabled Sigrid Blomberg to study privately abroad. In 1898 Sigrid Blomberg began what would become her most famous piece, Bebådelsen, initially displayed in plaster at the Academy and subsequently at the exhibition of Svenska Konstnärernas Förening. Bebådelsen was acquired in 1900 by Nationalmuseum and became the first sculpture by a female sculptor in their collection. The sculpture was ordered in marble and was hewn in Italy under the artist’s supervision. It depicts a young praying Maria, on her knees, with her head turned upwards to receive the archangel’s message. During the time it was on display, it was much loved by the museum’s visitors. The sculpture came to be mass-produced in miniature form in terracotta and could be found in many homes. By focusing on religious art, Sigrid Blomberg received many official commissions, enabling her to rent a studio in Italy, where she spent much of her time between 1900 and 1912. The largest piece of religious artwork she produced for a church was for the Gustav Vasa church in Stockholm in 1906. She modelled the baptismal font on the already extant baroque altar and made the church’s bronzed candelabras with allegorical figures representing Faith, Hope and Love. Another piece she made was Bönen, an upright, praying Christ figure, for the Edelweiss association’s chapel. Female sculptors, perceived to be more skilled than men at expressing feelings, were often commissioned to produce funerary monuments. Sigrid Blomberg beat Carl Milles in 1902, winning a commission to produce figures for the Röhss mausoleum at the Östra cemetery in Gothenburg. The Röhsses preferred her figures, finding them to be harmonious and distinct. The building was designed by the architect Hans Hedlund, whom Sigrid had known for years. The funerary monument, one of Sweden’s most expensive, was completed in 1907. Sigrid Blomberg’s bronze sculpture groups Sorgen and Hoppet were placed on either side of the main door, with Uppståndelsen placed on its roof. She also fashioned the main door in bronze, bearing the design of Sjungande flickor, along with busts of the Röhss couple, which were placed inside the mausoleum. In Gothenburg Sigrid Blomberg was also commissioned to produce the sarcophagus for Viktor Rydberg’s funerary monument. The design of the marble sarcophagus, which was hewn in Italy, was inspired by a skaldic poem called “De badande barnen”. The sarcophagus was installed in 1908 inside the monument, which was also designed by Hans Hedlund. Madonna del Fuoco was Sigrid Blomberg’s last sculpture, which she carved in wood in 1912. It was inspired by a vision she had seen in the flames of her fireplace at her summer residence Sista Styvern in Upplands Väsby. She lived there with her life companion, the author and historian Sigrid Leijonhufvud. Members of Stockholm’s female intellectual society Nya Idun frequently came for visits. The society’s drama group often rehearsed in Sigrid Blomberg’s Stockholm attic studio, which had previously belonged to Eva Bonnier and where she also taught sculpture classes for students including Astrid Bergman-Taube and Ninnan Santesson. Sigrid Blomberg was interested in the early Renaissance and her sculptural figures are strongly influenced by its plastic style. Her technical knowledge, paired with her devotion and emotional expressiveness, was valued by her contemporaries and her works garnered attention. However, she rarely exhibited her work, preferring to focus on commissions. Further to her religious pieces, she also produced busts for Dramaten (the Royal Dramatic Theatre) and portraits in relief. One of the last portraits she produced was a relief of Sigrid Leijonhufvud. Sigrid Blomberg’s productivity as a sculptor came to a stop when she became afflicted by an eye disease. Her sculpting career ended in 1912 and she subsequently provided for herself as a bookbinder. Additional illnesses soon forced her to move in with one of her sisters in Karlstad, where she died in 1941. Emma Emilia Sigrid Charlotte Blomberg, www.skbl.se/sv/artikel/SigridBlomberg, Svenskt kvinnobiografiskt lexikon (article by Birgitta Flensburg), retrieved 2019-04-24.